Call (260) 409-1138 – Chem-Dry of Fort Wayne pet urine odor removal service eliminates harmful urine stains on carpet, area rugs and furniture. You don’t want any kind of carpet stain but that’s even more true when it comes to pet urine. Pet urine is especially harmful for a couple of reasons. The first reason is due to the acidic nature of pet urine. The urine crystalizes in the carpet and becomes corrosive. Then the urine will begin to destroy the carpet fibers, carpet pad and possibly even the subfloor beneath. The other reason pet urine stains are so bad is because of their odor. 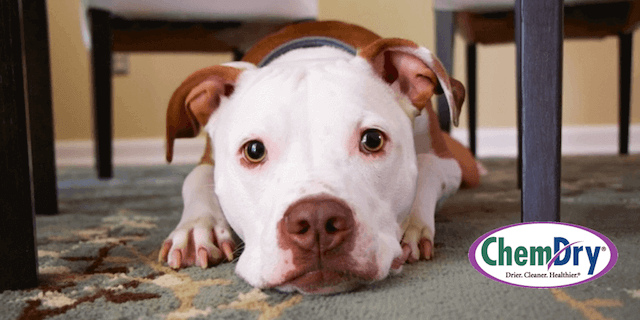 The odor from urine is very unpleasant but it’s also a problem because the smell will encourage your pet to continue to urinate in that same location on your carpet. The more your pet urinates on the carpet the greater chance the carpet becomes saturated and corrodes. If you notice a pet urine stain on your carpet, rug or furniture, don’t ignore it and don’t attempt to clean it yourself. Pet urine stains require professional attention. DIY pet urine removal solutions and store cleaning products are sometimes able to conceal the odor but cannot permanently remove it. You don’t want to conceal the odor because then the ultimate problem will persist. Chem-Dry of Fort Wayne does not conceal pet urine odors. We remove them. For good. How We Remove Pet Urine Odors? Our service starts with a UV light inspection to identify all instances of pet urine in the carpet, even spots that are invisible to the human eye. Once we know everywhere there is urine, we begin the process of removing the odor and cleaning the carpet. First, our technician sprays P.U.R.T.® on each of the stains. P.U.R.T.® will permeate the carpet in order to reach the crystalized urine. P.U.R.T.® is able to remove over 99% of odor from pet urine and over 99% of the bacteria within pet urine in only 24-36 hours. After Chem-Dry of Fort Wayne finishes spraying P.U.R.T.® onto the carpet, we start our Hot Carbonating Extraction (HCE) cleaning process. HCE uses heated suction to extract dirt, bacteria and toxins around the urine stains and helps restore the carpet to its original condition. Our pet urine odor removal treatment and P.U.R.T.® are two of the best solutions in the industry and are entirely safe for all pets. In fact, P.U.R.T.® has received the approval of famous veterinarians across the country. Our carpet cleaning outperforms steam cleaning and rental machines with healthier results. Technicians perform expert upholstery cleaning using chemical-free products from Chem-Dry. Chem-Dry of Fort Wayne professional rug cleaning eliminates dirt and bacteria from area rugs. Superior commercial carpet cleaning delivers healthier results and dries in just a couple of hours. Our techniques and solutions remove difficult carpet stains and don’t damage your carpet in the process. Try our FREE ESTIMATE online form. Find us on Facebook: Daily posts feature recipes, holiday planning, DIY projects and service information. How was your Chem-Dry of Fort Wayne appointment? We love customer feedback. Please review us here.